The Thatcher Effect is a well-known optical illusion, first tested with a picture of Margaret Thatcher. It's glaringly obvious, but humans almost always fall for it. So, it seems, do monkeys. The Thatcher Effect, or Thatcher Illusion, first made headlines back in 1980. 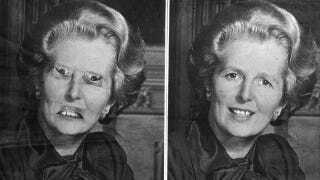 Professor Peter Thompson took a picture of Margaret Thatcher and manipulated it so that its eyes and mouth were upside down. The effect, when the face is right side up, is frightening and immediately obvious. Invert the image, and many people, at least during a cursory glance, don't notice. If people do see that the face is "off" in some way, they can't immediately pin down exactly what it is that's wrong. And even when they know how the face has been manipulated, they're still shocked when it's turned right side up. Scientists think that the fact that we don't immediately realize that the face is "Thatcherized" shows something about the pre-programming, or perhaps just the very early programming, of our brains. The brain is specially designed to recognize faces, but we are used to seeing faces in a certain orientation. When we see them right side up, we process them as a whole, recognizing how the parts fit together. Turn a face upside down, we process each part separately, without integrating it together. If all the shapes look approximately right, we can't really see how they fit as a whole. This is why we can immediately recognize the facial features of celebrities whose faces have been Thatcherized, even though we can't see that those familiar eyes and mouths have been manipulated. Determining whether monkeys fall prey to the Thatcher Effect took work. How can anyone know if a monkey is shocked by facial features? First scientists got monkeys used to a monkey face slide show. They put monkeys in a room with a screen. Every now and then a tone would sound, and the screen would show either a right side up or upside down monkey face - a face that had not been manipulated. The face would stay on the screen for 30 seconds, then would blink off. The screen stayed blank for 10 seconds, at which point the tone would sound and another face would appear. Understandably, this bored the monkeys. They looked away quickly, uninterested with the new faces. Then came the Thatcherized monkey faces. While the faces were upside down, the monkeys took no more notice of them than any of the other faces. When the faces were right side up, though, the monkeys stopped and stared that that weird-looking monkey on the screen. Evidently, monkeys fall prey to the illusion as much as we do. The researchers, noting that humans find Thatcherized human faces very disturbing, suggest doing the trial again, but putting the next round of monkeys on heart monitors before showing them Thatcherized faces. They want to know if the monkeys have the same emotional reaction that we do.